In Taiwan, if you want to subtly ask someone for his age, you can ask him what Chinese zodiac animal he is. The 12-animal cycle makes it so that as long as you can approximate how old the person is (which still can be hard in Taiwan where 50-year-old women might dress and look like they are 20), knowing the animal gives you the specific year. For example, if I tell people I am a snake, they know I was born either in 2001, 1989, 1977, 1965, etc. * Hopefully they already know which one of those to pick. *disclaimer—because the new year is based on the lunar calendar, it doesn’t align exactly with our 12-month cycles. So if you were born in 2012 before January 23, you’re actually still a rabbit, and if you were born afterwards you’re a dragon, since Jan 23 was the date of the new year this year. 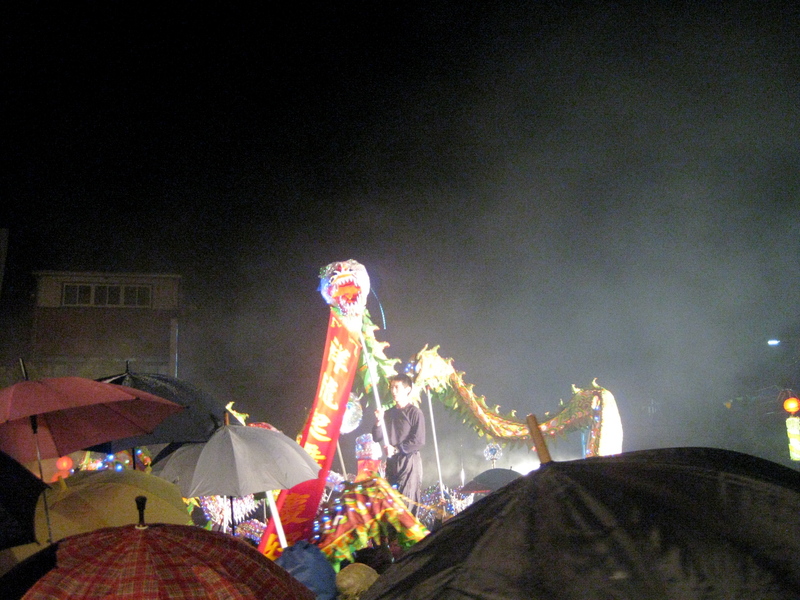 This year is the year of the dragon. 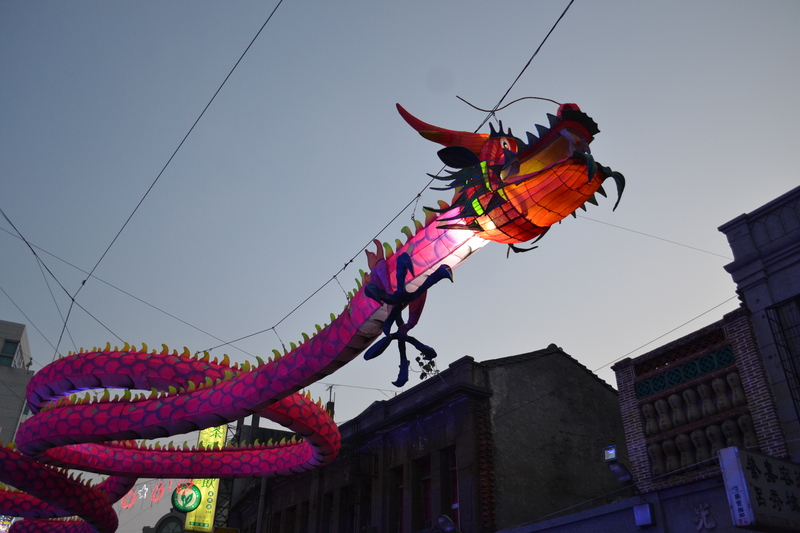 You’d think that means you can celebrate extra hard if you were a dragon (born in 1988 or other 12-year intervals), but it actually means you have to be careful since you might be prone to more bad luck this year. To ward off the bad luck, if it’s your zodiac year you are supposed to try to wear red every day. Rather than going through a complete wardrobe change, superstitious Taiwanese will just buy a set of red underwear and wear it for the year. They sell days-of-the-week red and gold dragon underwear in 7-11…I’m not kidding. 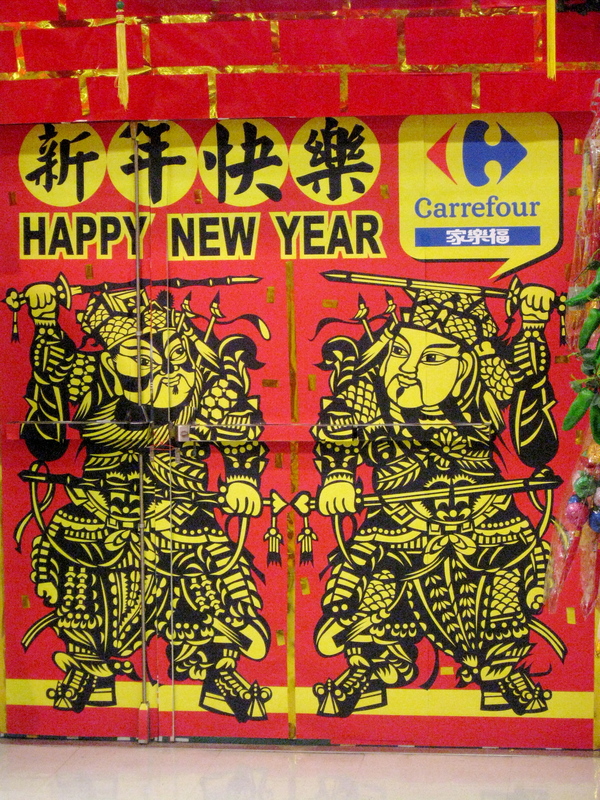 Before Chinese New year, you are supposed to put a “春” on your door. This character means “spring,” because Chinese New Year traditionally ushers in the start of spring in the lunar calendar (never mind that the week after Jan 23 was apparently freezing and raining in Yilan). 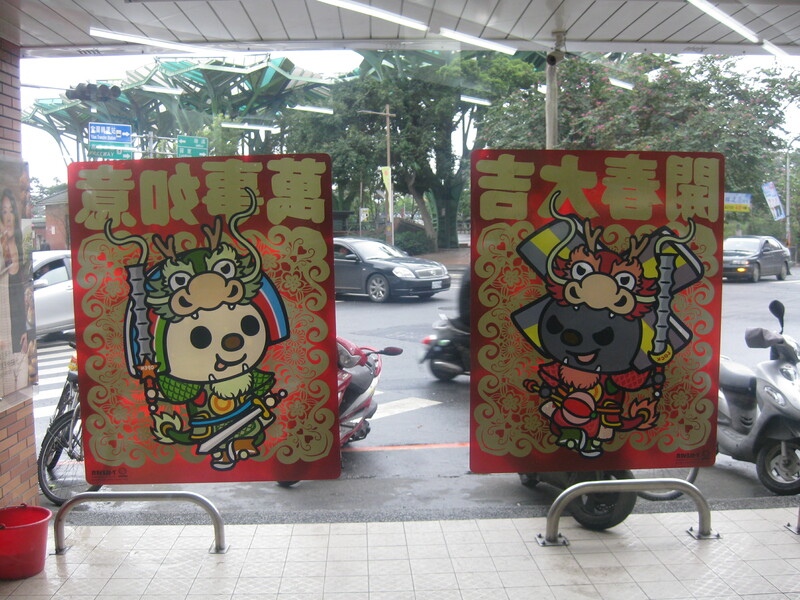 To say “spring has arrived,” you say “春天到了”(chuntian dao le), but this “dao” can sound like the “dao” that means “upside-down,” so Taiwanese people, using this pun, hang red and gold “春” signs upside-down on their doors for good luck. They also hang spring couplets, usually wishing health and wealth upon the family. 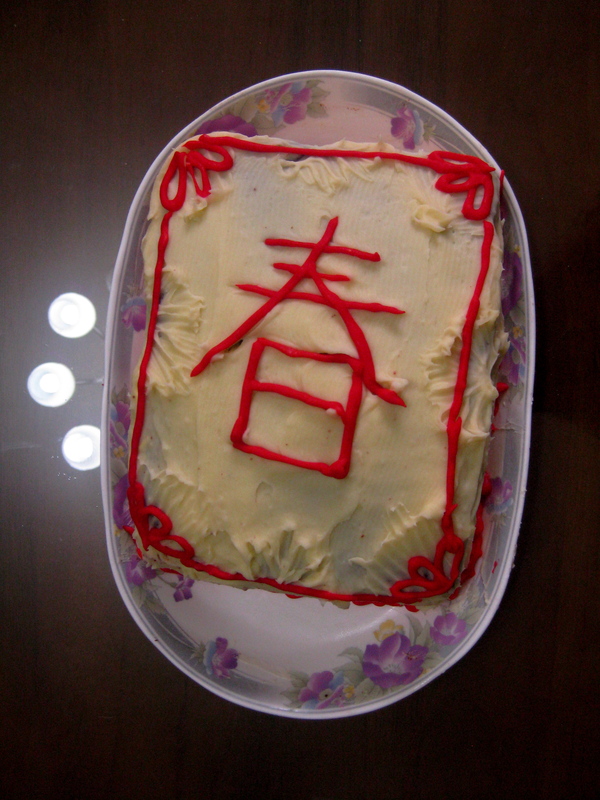 My roommate and I made an (auspiciously) red velvet cake complete with a red “春” iced on top for our Chinese New Year feast at my co-teacher Yvonne’s house. We made the cake in two small pans in her TOASTER oven, because people usually don’t have ovens (or microwaves) here. It tasted just as amazing, though! 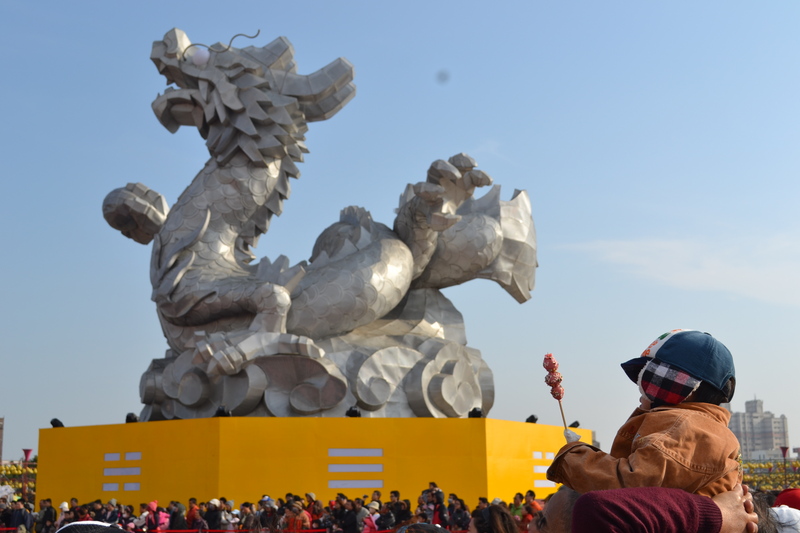 A common new year’s saying, reading the characters from top to bottom, is “nian nian you yu,” or “with every year may there be more left”…meaning, even if we use up luck, food, or money, may there always be some left for next year. 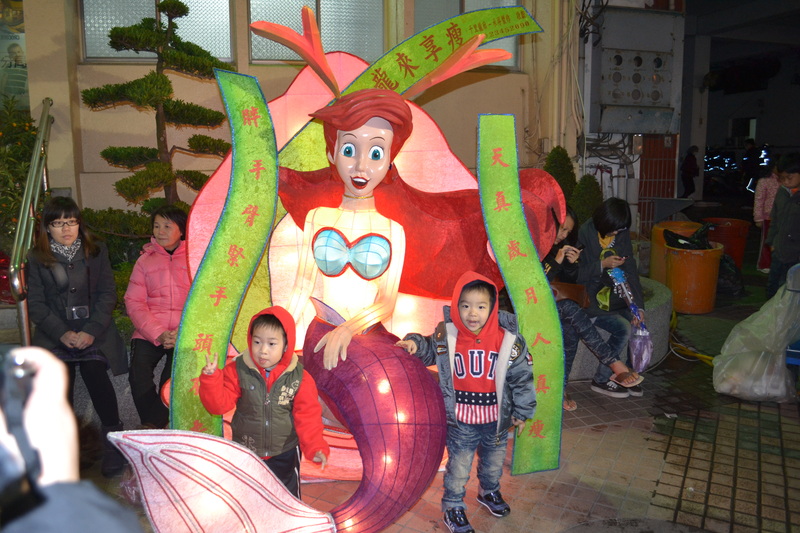 However, because “yu” also sounds like “fish,” as a pun Taiwanese people will write “May every year have fish,” and when they eat fish at the New Year’s feast they always make sure to leave some leftovers for the upcoming year’s luck. 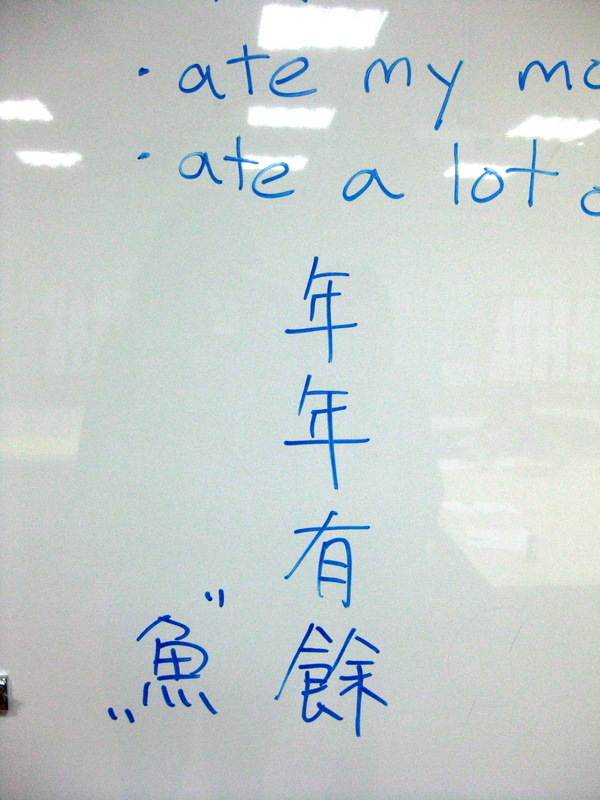 This picture is from Yvonne and my students teaching it to me during English Club. 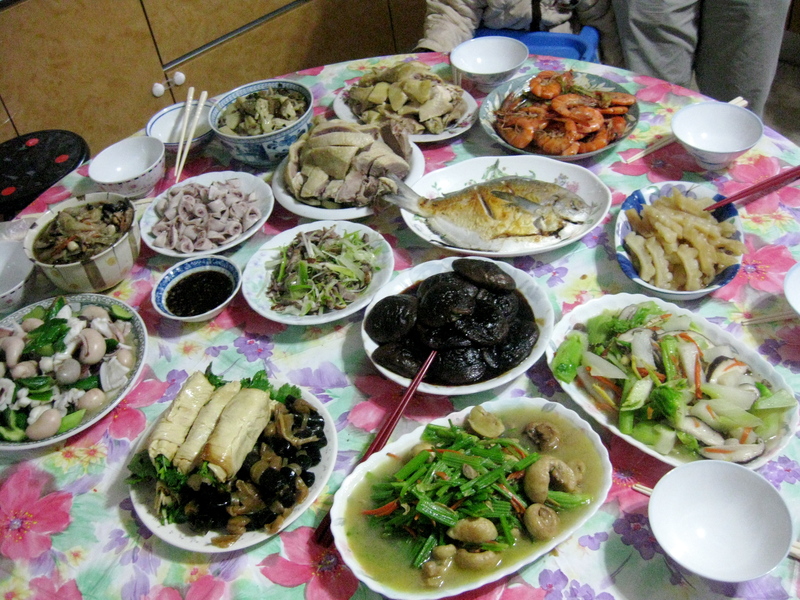 The day before the new year (which according to the lunar calendar actually starts at around 11pm, not midnight), Chinese families have a HUGE family feast, usually over a round table with dishes upon dishes. Yvonne’s adorable twins (English names: Kylie and Kyle). Kylie’s wearing the fleece my mom got her! The twins, bracing themselves on the table to reach further for the cake, refused to talk to anyone in their single-minded pursuit of more cake. 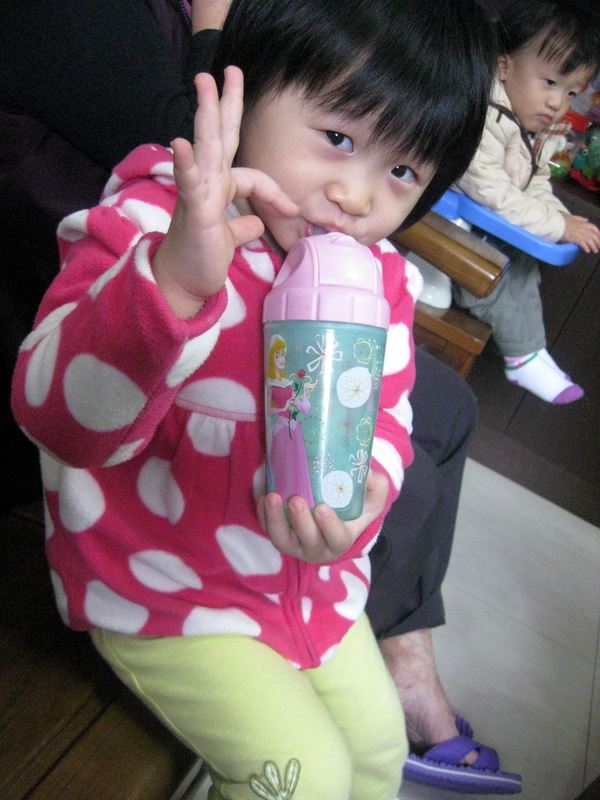 Even the one-year-old cousin (not pictured) was crying and clamoring for more. I fear we’ve made their taste buds American forever…never will eggy or airy Taiwanese pastries satisfy them. #successful baking. 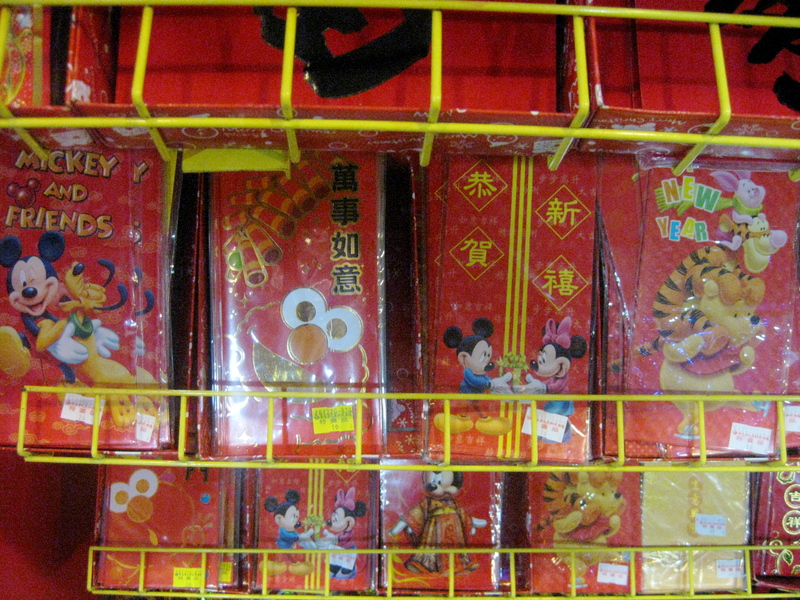 Younger people receive red envelopes (紅包) from elders, with cash inside. 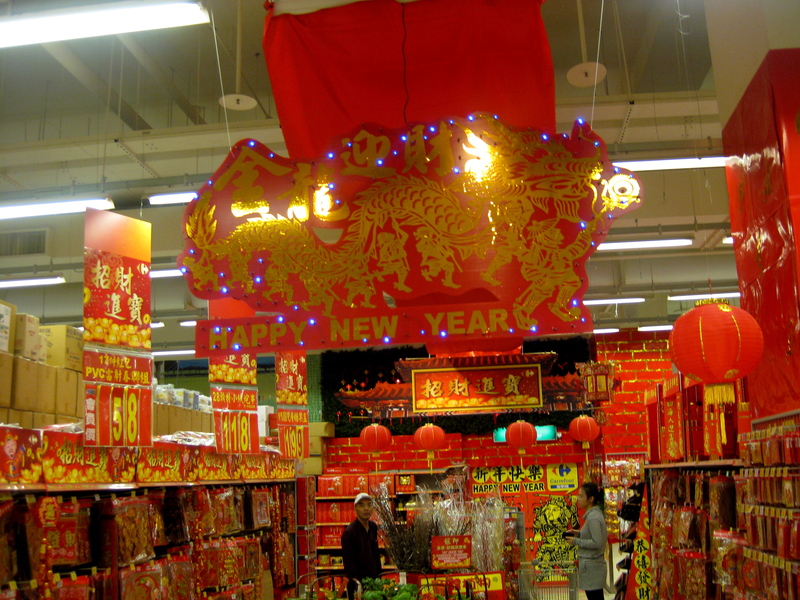 The red envelopes are a stationery line of their own: the store’s vast Chinese New year section had Spongebob gold-embossed ones, Snoopy ones, Doraemon ones, and my favorite—dumpling ones. Even Mr. Brown coffee gave out red envelopes. 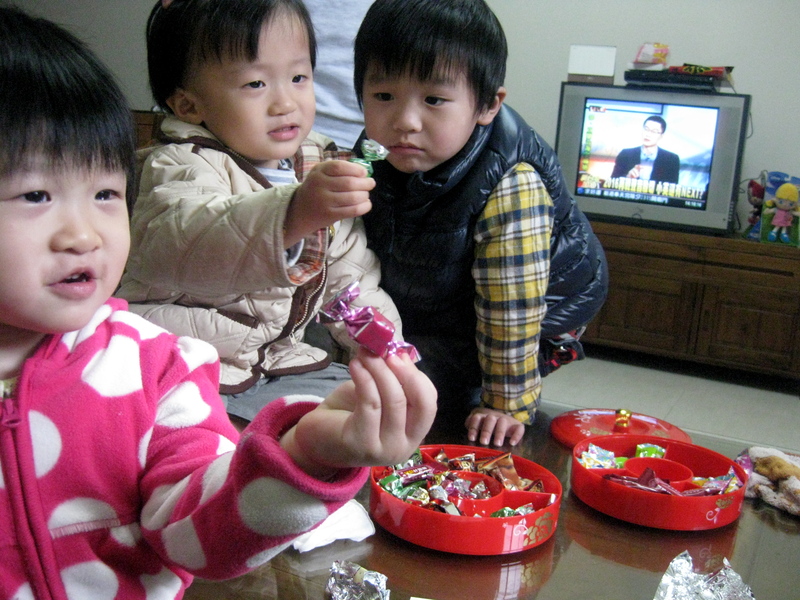 Taiwanese people don’t really celebrate Christmas, so this is the one holiday kids get presents. It’s money, not an actual gift, but they still get really excited because they know every elder will give them one. They even have a chant: “gongxi facai, hongbao na lai 恭喜發財紅包拿來” which means “Happy New Year, give me a red envelope!) It’s really cute. 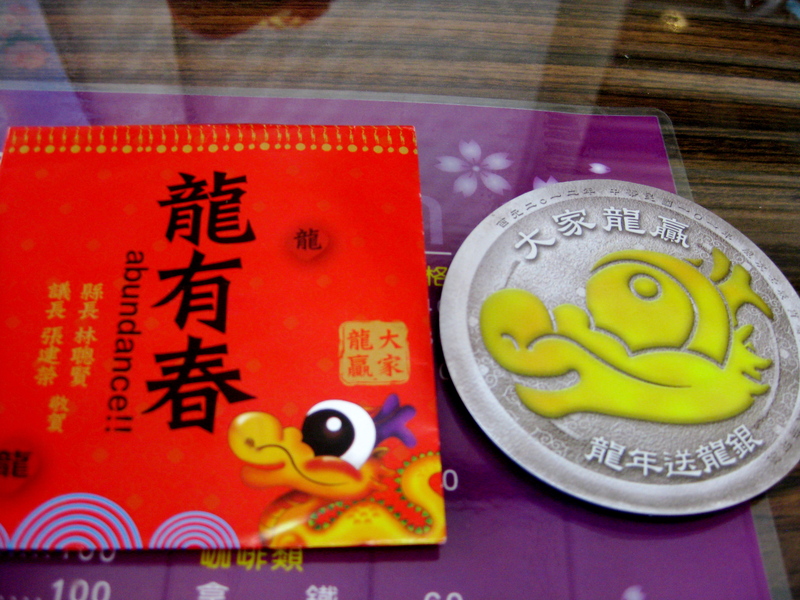 In a hongbao, the amount of money can only end in even digits (2, 4, or 8….no digit should be 4, which is bad luck). For funerals, people give the grieving family a “baibao,” or white envelope, and in these the cash traditionally ends in odd numbers. 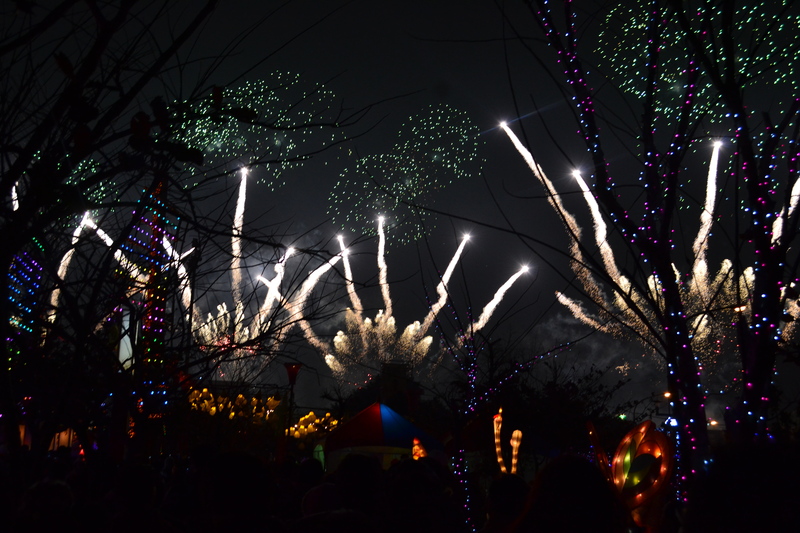 At the new year, fireworks go off and kids light up firecrackers. 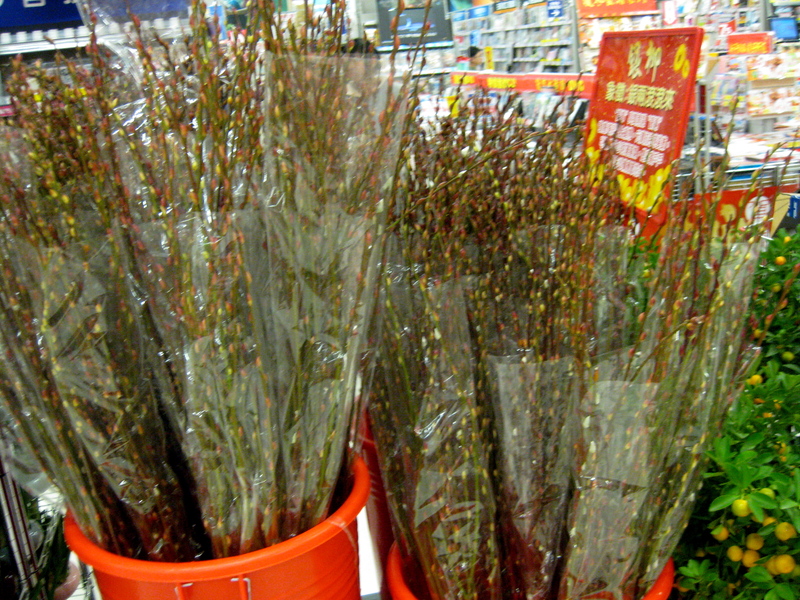 This tradition, rather than symbolizing celebration, is actually meant to scare off the “Nian 年” (this means “year” in Chinese). The Nian, as the story goes, was a mythical creature who would come down from the mountains and eat small children in the village every new year. To get rid of him villagers would put food outside their doors before the new year, hoping to satiate him. That was not enough, so then they discovered that wearing red and setting off firecrackers would do the trick. 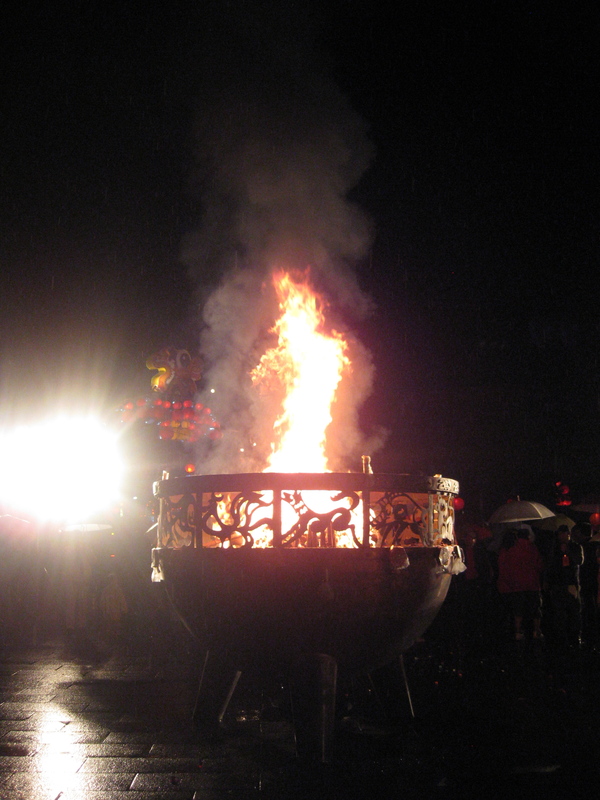 Apparently Nian was later captured and became the vehicle of a Taoist monk, but the firecracker tradition still continues. There were fireworks going off at all hours around Chinese New Year—startling in an area that is otherwise devoid of any activity (shops and restaurants close for Chinese New Year as people go home to spend time with their families). 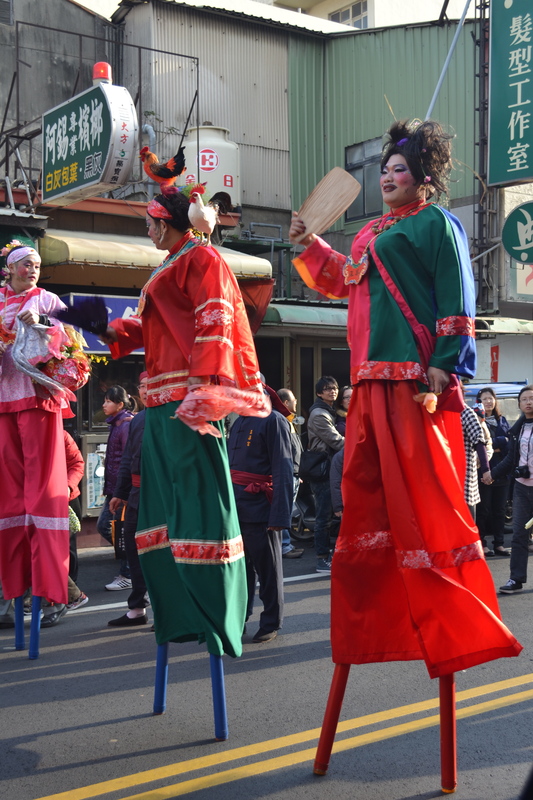 For Taiwanese people, the new year celebrations are like our Thanksgiving, Christmas, spring cleaning, and New Year’s rolled into one. Before the new year, the house must be extensively cleaned and all debts repaid, in order to sweep away bad luck and start the new year with a clean slate. When we waited for the trash truck during this time, it would be a whole 30 minutes late. 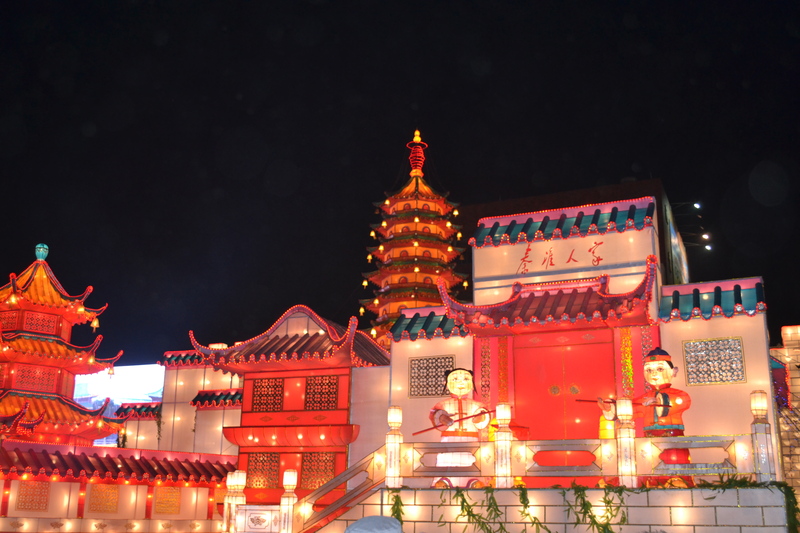 In addition to the big family feast on the Eve (Chúxī 除夕), on the first day of the new year you honor your elders and try to visit the oldest member of your family; on the second day, women who are married go back to their parents’ house, on the third day, you are supposed to be antisocial and stay at home. The days go on like that, with various traditions for each day, until you reach the 15th day. 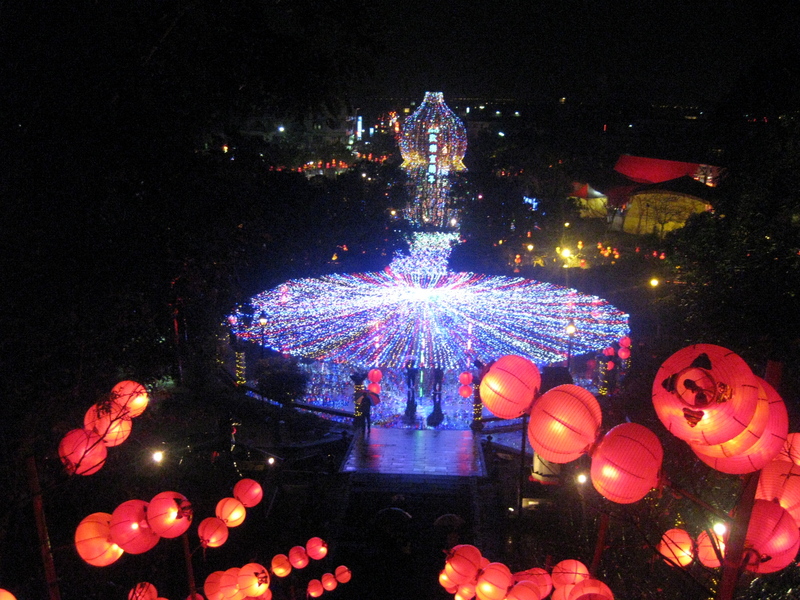 That day is Yuánxiāojié (元宵节), the start of the Lantern Festival. 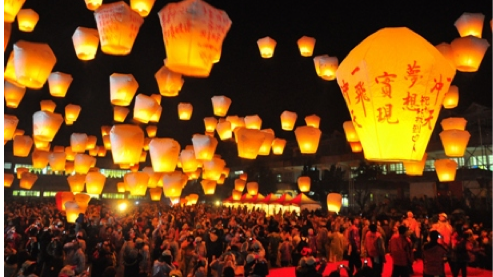 In Pingxi, Taiwan, hundreds of sky lanterns are simultaneously released into the sky on this day (unfortunately, I wasn’t able to make the festival, but here’s a picture from the internet). 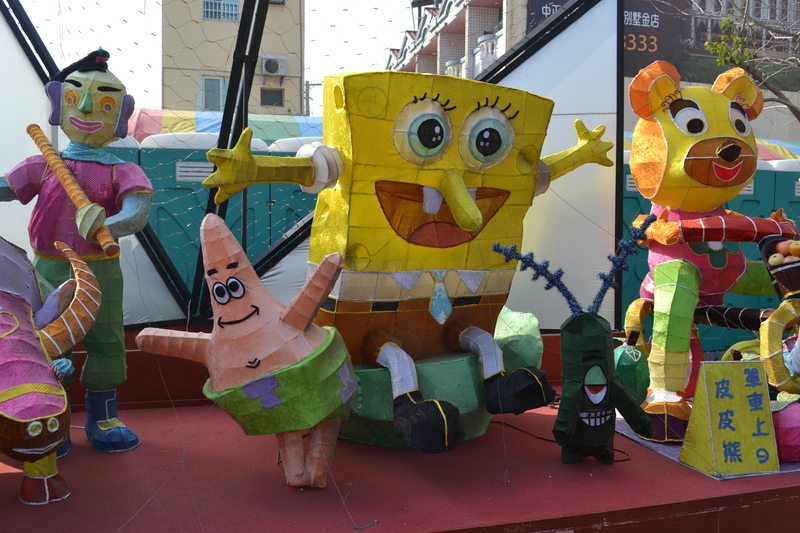 There were lanterns everywhere that had been submitted for this year’s contest–the theme was something involving fruits and vegetables. 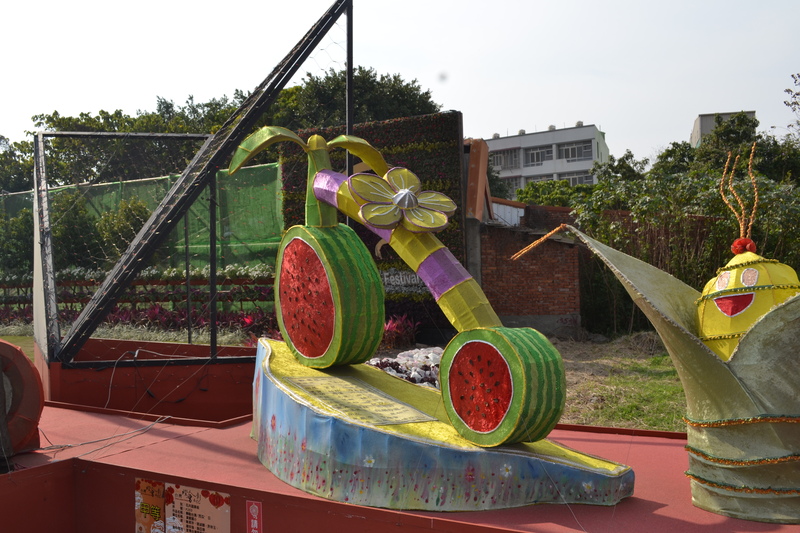 This watermelon bike was my favorite! 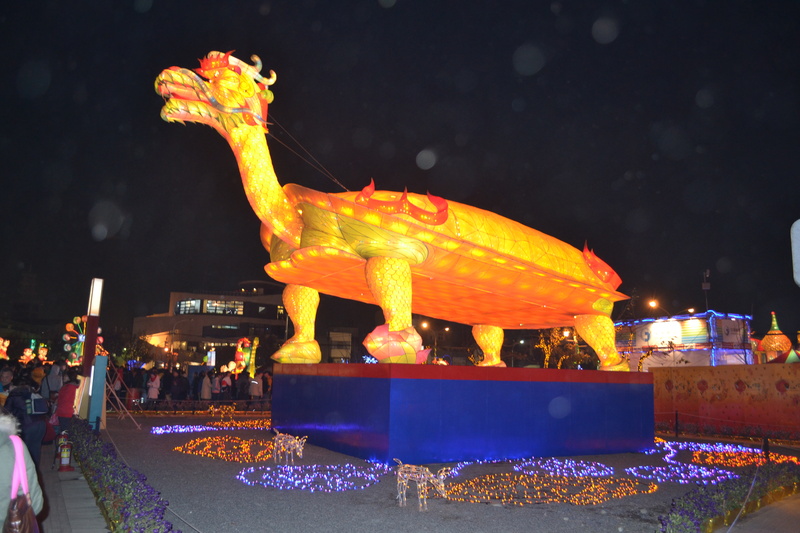 The absolutely HUGE main dragon lantern. 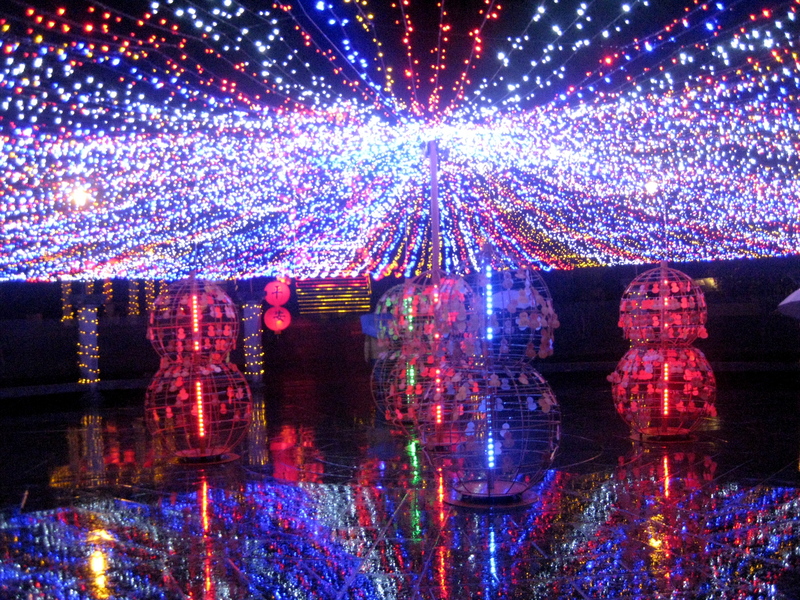 It’s gray by day, but at night it lit up into a dazzling array of bright colors and flashing lights..and even moved! 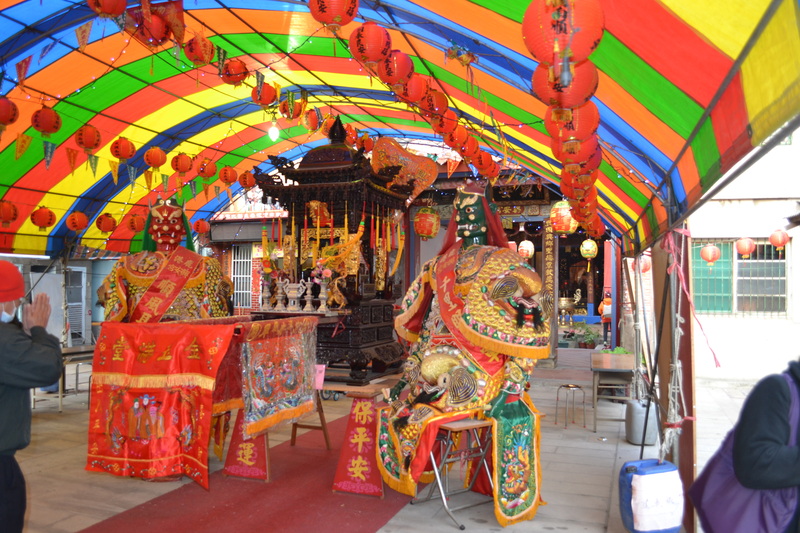 Interesting Matsu (sea goddess) Taoist temple: you walk in a special way around objects, crawl through about three tables, essentially making your way in an obstacle course to the main altar, where you pray. 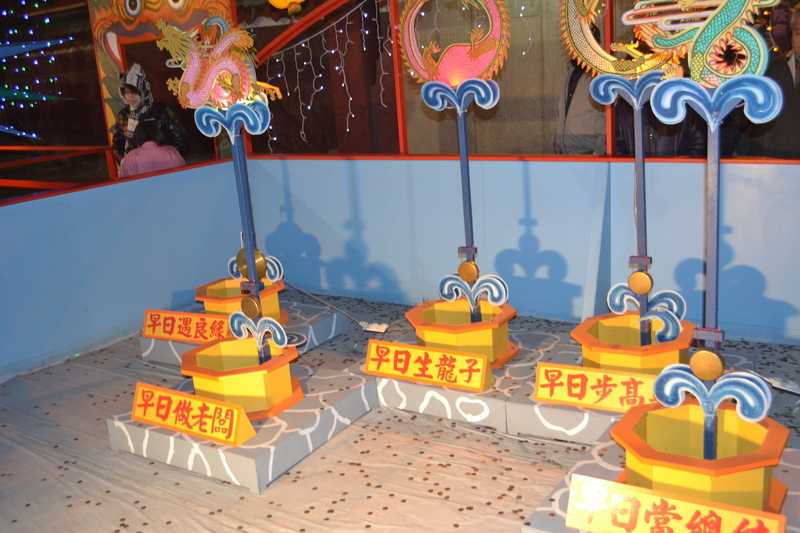 You could throw coins and try to hit the mini gongs under each of these dragons. One was for winning the lottery, one for becoming a boss, one for becoming president, one for finding the perfect lover, and one for giving birth to a son (really). Apparently, I’m going to win the lottery, become president, AND find the man of my dreams. Phew! 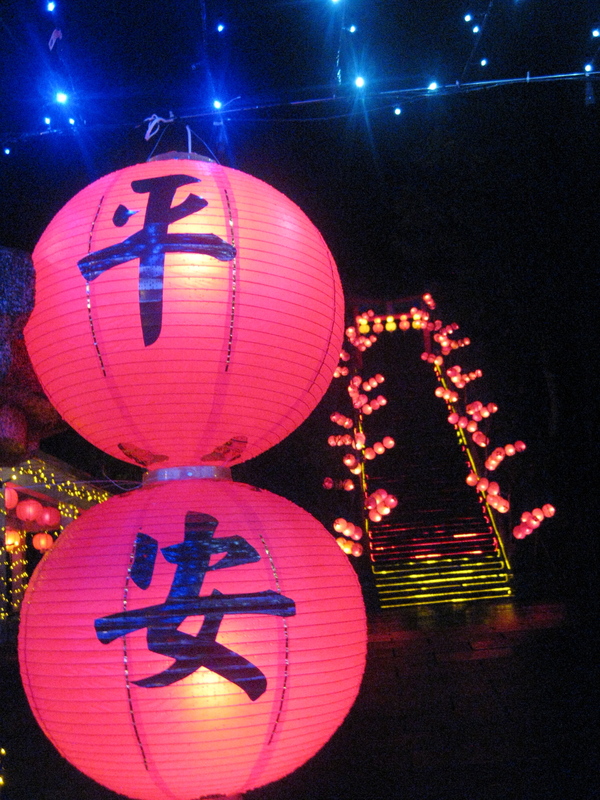 Mainland China contributed these lanterns to the festival, heralded in a nearby placard as a sign of unity. Before he was a dragon, he was a…turtle? 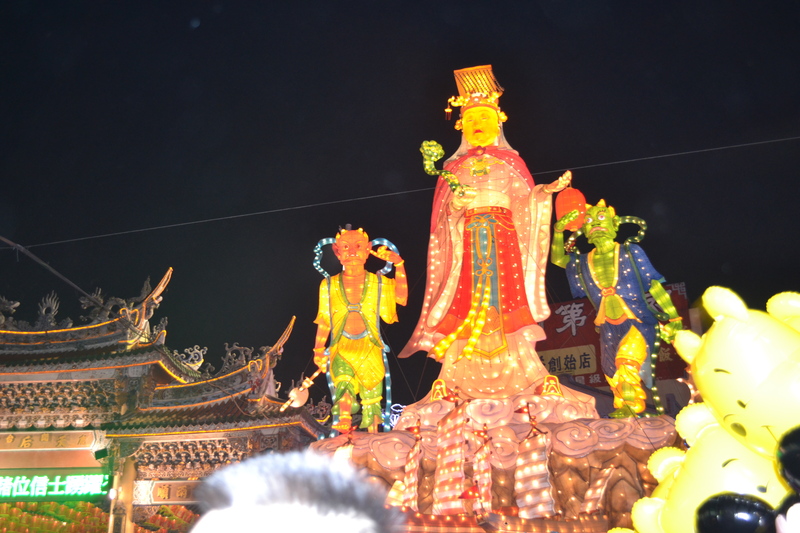 The lantern festival was awesome, but the transportation back from it was a nightmare—when we went to the line for the bus back to the train station, we realized with shock that it was thousands of people long. After trying desperately to get a paid bus or taxi, and realizing that the free public shuttle bus was actually the only option, we cut the line as an ambulance went through the crowd, hoping that within an hour and a half we could get on the bus and go to the train station to catch our night train. Two hours and many Disney song renditions later, we were running to the train platform, prepared to cry, storm, and wrangle our way onto a train. Unfortunately, we had missed ours, and there were no more for the next 6 hours (till 2:40am). But—after many harried conversations in Chinese with various ticket people, we were able to get our money back for our tickets (amazing considering the train had already left), take a short hop to the nearest High Speed Rail station, and take that instead to Taipei (from which we took a bus to Yilan). The High Speed Rail is a thing of beauty, that is all I have to say. All in all, we ended up back at Yilan before we would have even boarded that 2:40am train. 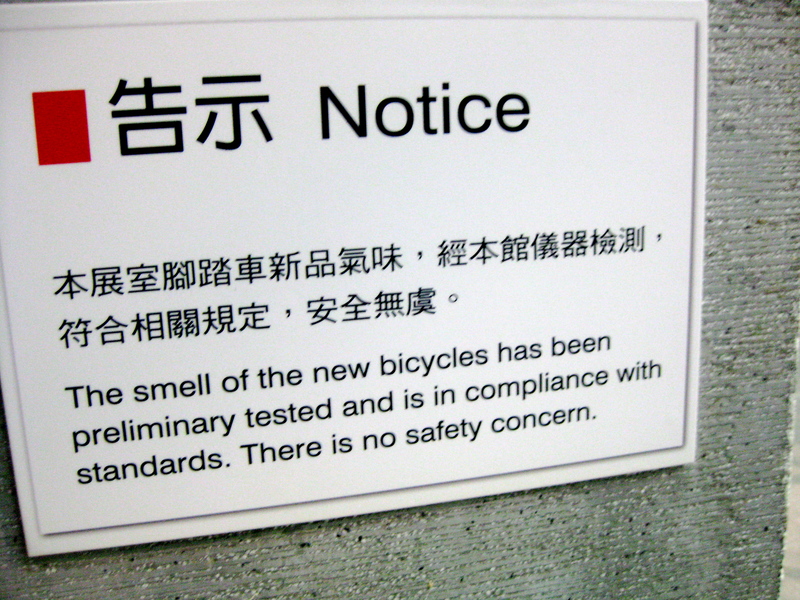 It was probably the most pleading in Chinese that I have done, including past bargaining experiences. 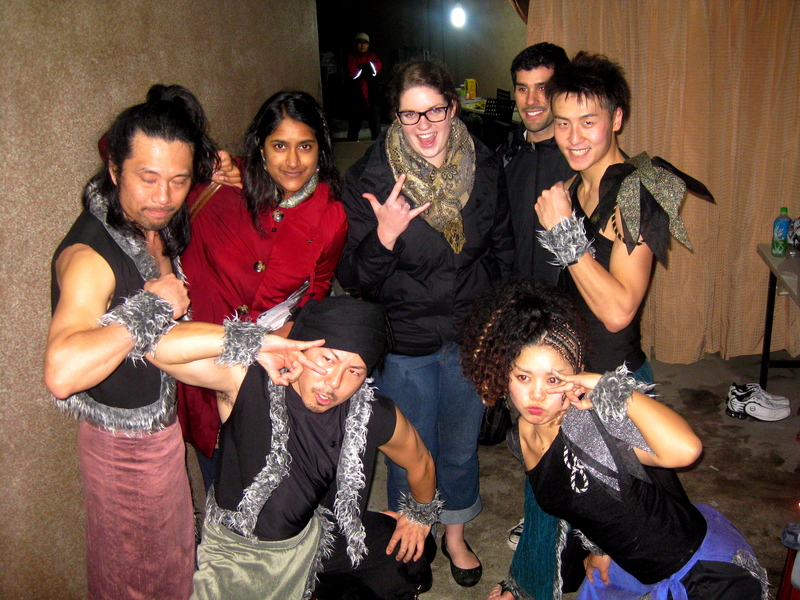 But it goes to show that knowing enough Chinese to be willing to make a complete spectacle of yourself, but not being native enough that you feel embarrassed, is worth it. 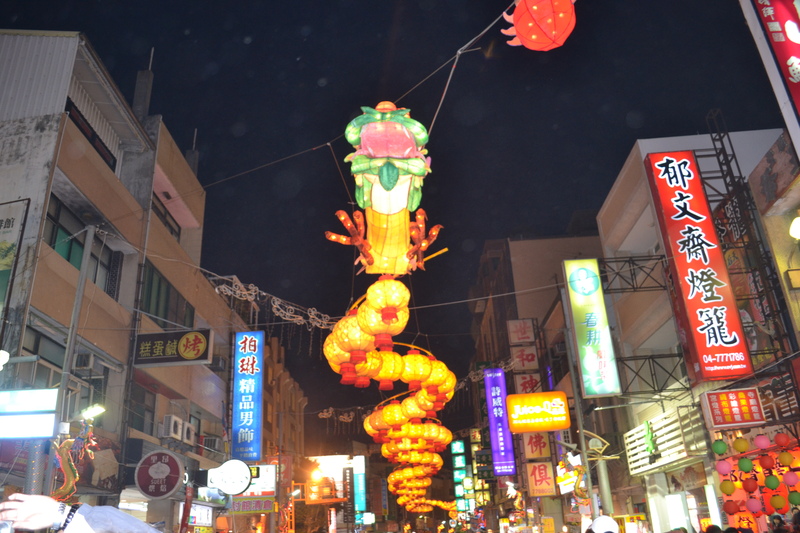 The whole lantern festival ended on Feb 19…all the festivities associated with the new year lasted almost a month! As a result, we got three weeks off school (a huge break considering that the rest of the whole year, we only have a total of 4 days off). Hence my blogging lull—lots of things to write about…more updates coming soon! 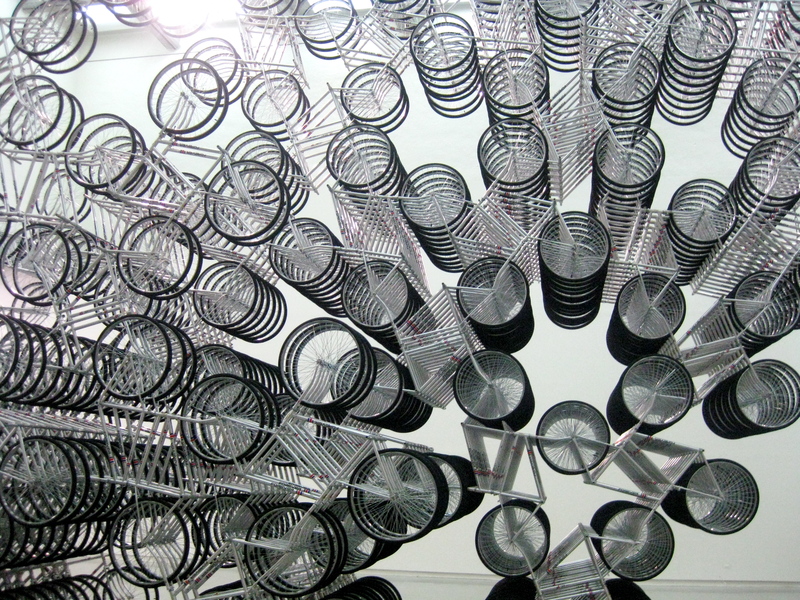 Visit to the Taipei Fine Arts Museum’s exhibit “Absent,” by Ai Weiwei. 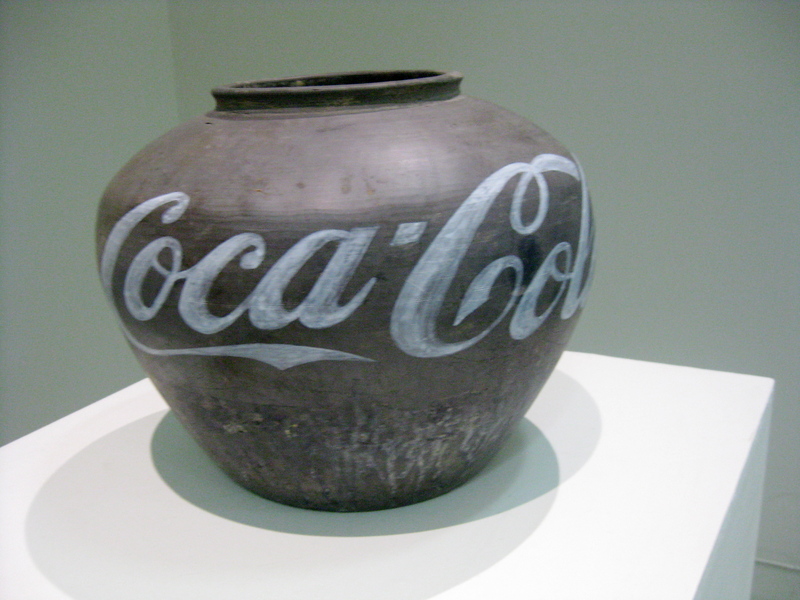 Ai Weiwei is a Chinese artist and dissident whose art has been openly critical of the PRC’s treatment of human rights. Despite this, he was still asked to consult on the 2008 Bird’s Nest Olympic stadium in Beijing…but in 2011, he was arrested for a few months as soon as he arrived in the Beijing airport. There was an international outcry and demand for his release, which was eventually granted. The exhibit he has here in Taiwan is something that could never be shown in China. 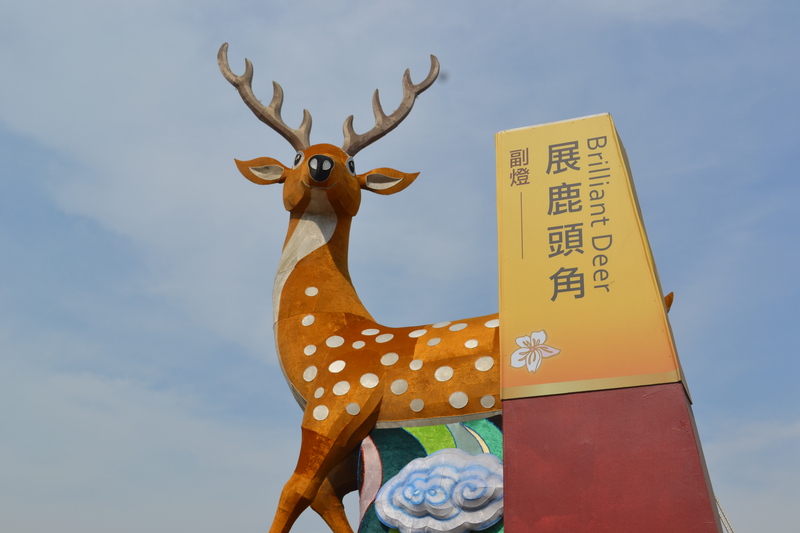 Outside the exhibit are his statue interpretations of the 12 zodiac animals, designed to reveal something beyond their traditional persona–perhaps something about the warping of traditions in China today, I’m not sure. 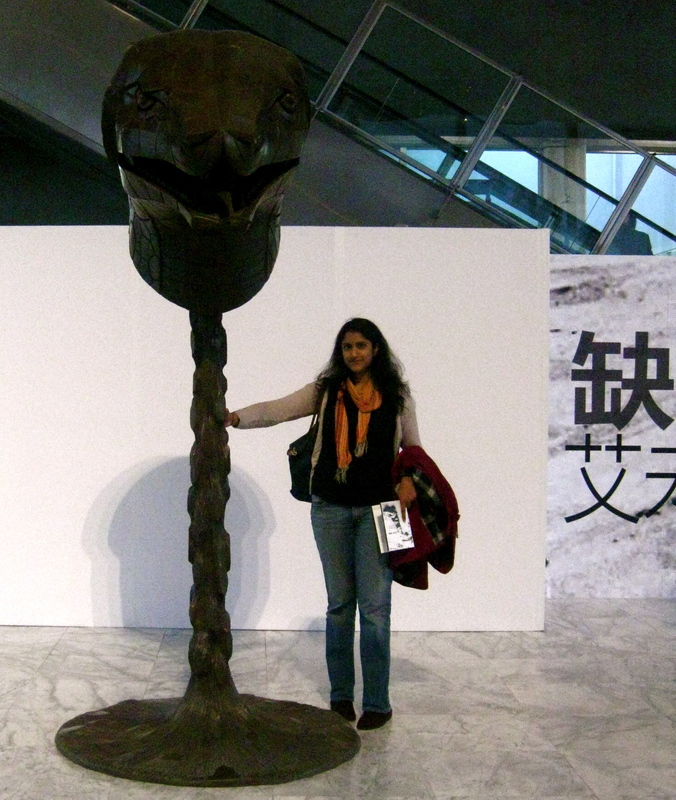 Here I am with the snake (my zodiac year). One of my favorite meals was dinner at my student Andrew’s house. I’ve written about Andrew before–he’s the one who cried once when I had to miss English Club, because he thought I had returned to the U.S. for Christmas, never to return. Andrew is an only child but always tries to be incredibly social, with his earnest smile and way of cocking his head when he’s listening to you. He’s a new student, though, so he doesn’t have that many friends yet. 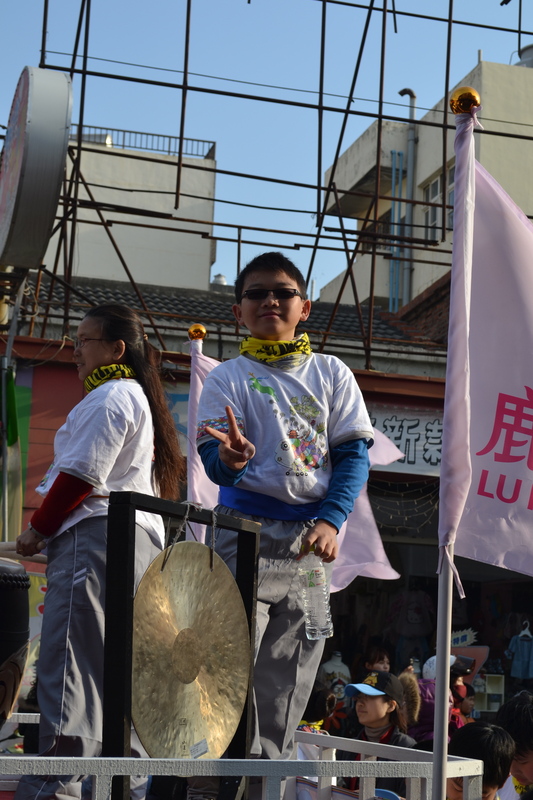 His parents met while studying in the U.S., so they have amazing English (rare for parents in this area unless they are English teachers). 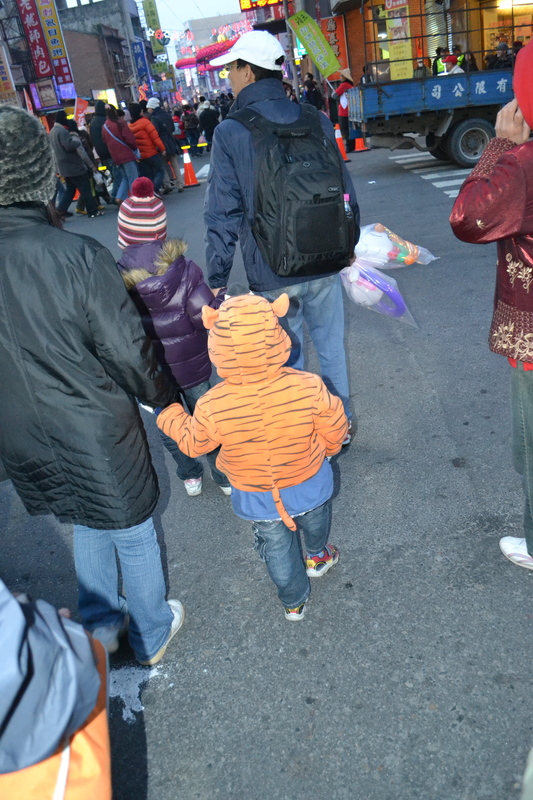 Andrew was actually born in the U.S.–his mom told me during the dinner that she found some language program so she could get a visa to go to Florida while pregnant, with the ulterior motive of actually giving birth to Andrew on U.S. soil. 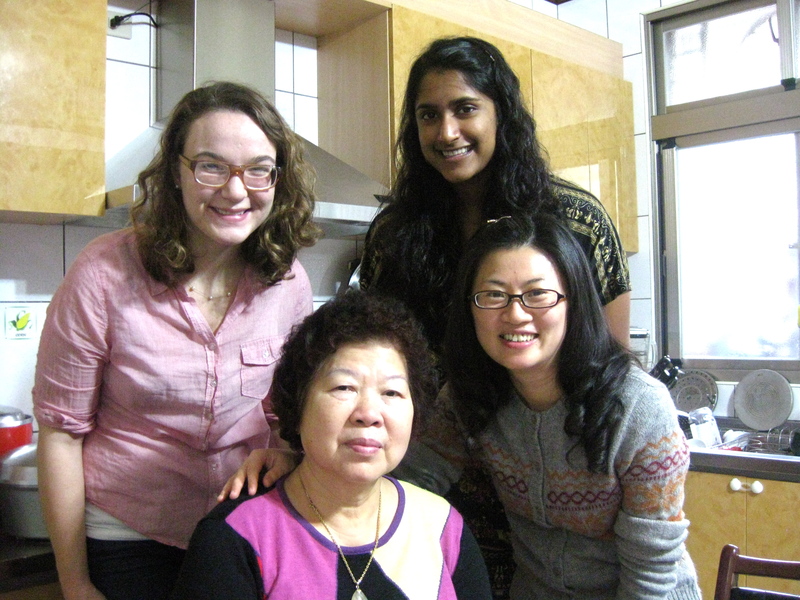 She said the ESL school was all recent immigrants, mostly young adults, and she stuck out as the soon-to-be-mom. In her last months of pregnancy, she said, her husband attended the ESL classes so they could keep their visa, and finally she gave birth to Andrew…and all this for American citizenship! Andrew is such a curious and creative child, so obsessed with National Geographic and drawing his own cartoons. He was helping his mother around the kitchen when I arrived for dinner, and only when done helping did he bring out his prized stamp collection and invite me to peruse it. As a surprise, I brought him a stamp my roommate had from the U.S., and put it inside a hongbao. I have never seen a kid so happy–he pulled the stamp out, blinked thrice, gave me a huge hug, gave his mom a huge hug, then started doing laps around the kitchen. 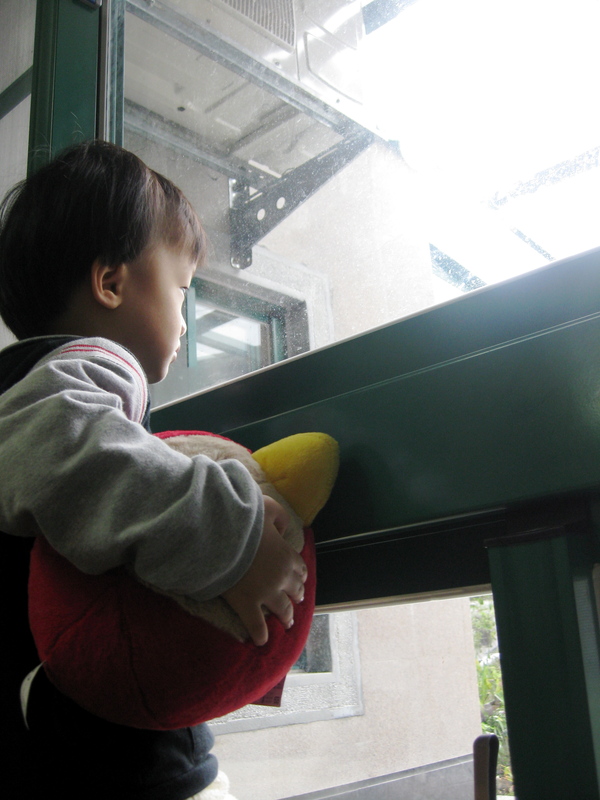 Andrew’s mom seems dissatisfied with education here in Taiwan, feeling it’s too severe, cram-school focused, and dampening on creativity. She switched her son into Jhongshan hoping it would get better for him. She tells me after English Club every week how happy she is to see her son finally actually feel good about his English, confident in using it, and excited to start his homework in something. It makes me well up with pride and a sense of accomplishment when I hear her words. I’m hoping to see big things from Andrew, and all my students.